The first of its kind in the city, Down the Hatch Liverpool has bravely created a ‘junk food’ menu to rival all others, with the only ‘catch’ being that the whole menu is Vegetarian (with most things even being totally Vegan). The Restaurant itself is placed underneath Duke Street after a narrow set of stairs which I guess makes it, quite literally, ‘Down the Hatch’. A little dark and gloomy inside, it has the perfect, grungy atmosphere you’d expect from a junk food diner, with a small open kitchen at the back. I arrived around 5.30pm with the type of post-work starvation which can be extremely dangerous in these types of places and after a quick catch up with the girls I ordered a San Pellegrino (best soft drink ever in my somewhat controversial opinion) and set to work on the menu. I don’t know whether it’s because we’re a bunch of indecisive girls or just all huge foodies that want to eat everything on the menu but we always seem to choose a couple of ‘sharer’ options to start and my pick was the ‘Hatchos’ – homemade nachos topped with BBQ Jackfruit, salsa and jalapenos. To be honest, I was really curious to see how the Jackfruit would compare to the beef chilli or pulled pork that is usually piled on top of cheesy nachos and I’m going to say it was better. Before my Down the Hatch visit I’d never even heard of a Jackfruit, but the sweetness of the fruit and BBQ sauce, the heat from the Jalapenos and the tangy taste of salsa worked perfectly on top of crispy, salted tortillas and we had absolutely no trouble polishing off the whole bowl. For those (like me) that are ignorant to the world of exotic fruit, a Jackfruit is from the fig and breadfruit family and is used regularly as a meat replacement in Vegan recipes. Before you question the audacity of whoever decided to replace meat with fruit I beg you to give it a try. It’s good. Really good. Another starter choice (fuelled by endless Instagram foodporn and my never-ending love for deep fried everything) was the ‘cauliflower 5 ways’. There is something about Cauliflower I do really enjoy so I was intrigued to give these a go (plus if it’s a vegetable it’s gotta be good for you, right?). I can only guess that the battered Cauliflower portions were supposed to represent fried chicken pieces and they came out on a big wooden board in five different flavours – chipotle & honey, buffalo style, cheese sauce, beer battered and garlic butter. Naturally, although not strictly Vegan, my favourite was the cheese sauce option (reasons why I couldn’t be Vegan number 59 – cheese) but they were all pretty damn good, sizeable portions and definitely a great sharer. Sometimes Tempura veg, particularly ‘blander’ options like cauliflower can be totally tasteless but if there’s one thing Down the Hatch do well, it’s flavour – every single dish packed a complete punch, without overpowering the palette. Moving swiftly onto main courses, it had to without a doubt be a burger, or ‘bun junk’ as the menu named them. I have to admit that the burger options weren’t as vast as I’d expected from a ‘junk food’ venue – but then quality over quantity is definitely where it’s at and believe it or not I still had a hard time deciding what to go for (I’d been set on getting a burger for the entire day after a pitiful lunchtime salad, but next time I pay Down the Hatch a visit, the ‘Big Mack and Cheese’ is definitely on the agenda). I eventually decided on the ‘Satan’s Zinger’ which was a ‘spicy satan fillet’ (still not really sure what this actually is) ‘howl at the moon hot sauce salsa’, salad and hatch mayo served with more crispy, thin fries than the whole of Maccies (I wasn’t complaining) and creamy slaw. The burger was perfect and the fact there wasn’t a single bit of meat inside the soft, seeded bun made absolutely no difference whatsoever. The menu didn’t actually say what the patty was made up of but I’m going to liken it to Quorn. It was a really nice meaty texture full of peppery heat which was accompanied by the equally fiery salsa, all cooled down with velvety hatch mayo. Now I like things spicy which is probably why I enjoyed this option so much – if you prefer life a little more mild then I’d maybe go for the ‘Captain Jack’ option which is filled with delicious Jack Fruit, sloppy joe style. It’s a given that every Junk Food joint is going to have a burger on the menu so ridiculous Adam Richman himself would struggle with it, and one of the girls, in true yolo style, went ahead and ordered it. 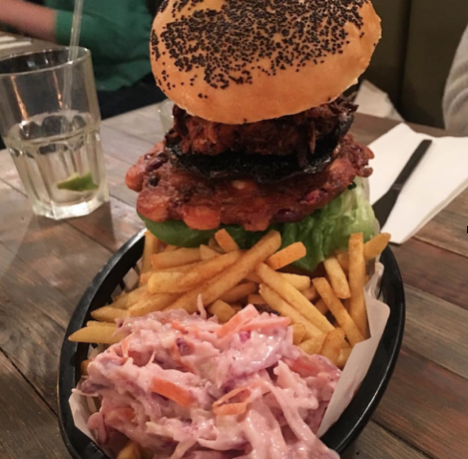 The Incredible Bulk burger was a masterpiece and with it containing a three bean patty, a Portobello mushroom, halloumi cheese, potato rosti AND a fried egg, it was a given she wasn’t going to finish it alone. That’s where I came in (what are friends for?!) so can vouch for the fact that this was also delicious. There is something about a hash brown on a burger that is so totally wrong but totally right at the same time. Cheesey, juicy, saucy goodness which held together surprisingly well despite the copious amount of fillings. A solid choice for the brave-hearted. All in all, Down the Hatch was a fantastic experience and a definite eye opener for meat lovers everywhere. Yes, you can’t beat a good steak from time to time, but who knew there were so many meat alternatives that could bring together such a bloody good menu? Cheers to the clever, creative Scousers behind this place, I’ll definitely be going Down the Hatch (and rolling back up) again very soon.